Last season, Soho Rep’s An Octoroon by Branden Jacobs-Jenkins was one of those plays that everyone was talking about and not enough people got to see. Theater for a New Audience has brought it back, to their beautiful new Polonsky Shakespeare Center in Brooklyn, with a run that extended before it even opened. 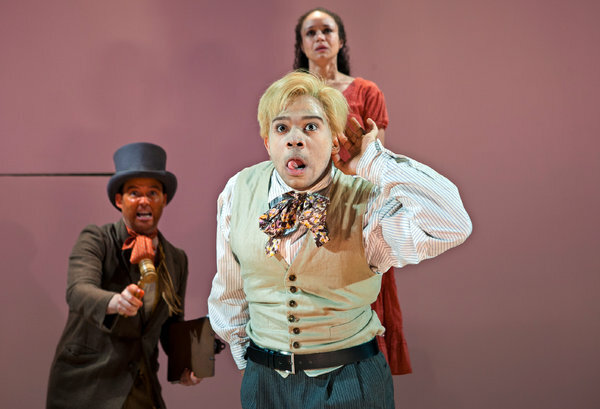 An Octoroon has so much going for it, it’s not hard to understand why. The play is a deconstruction of an 1859 racist melodrama rethought through the viewpoint of a black playwright, BJJ (Austin Smith), who happens to share the initials of the actual author of the show. 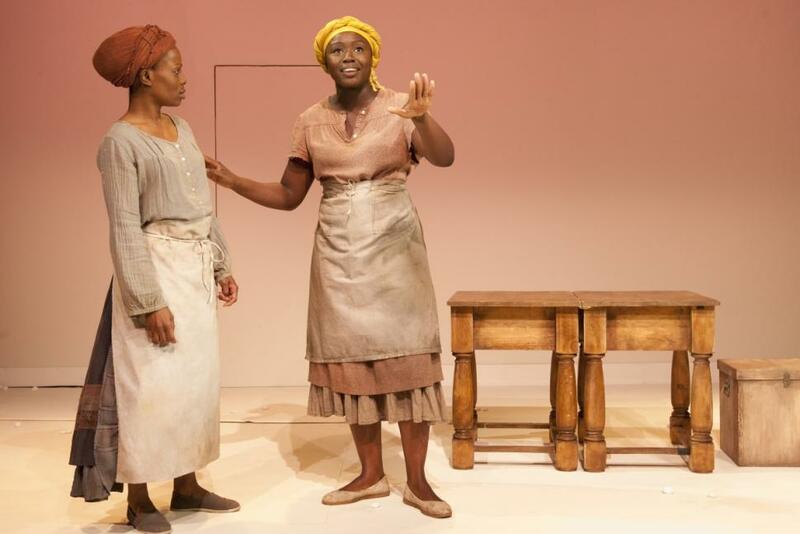 The play begins with BJJ questioning that very label, and from then on An Octoroon leaves little unchallenged, including the very nature of reality versus fiction. Shortly after this declaration of identity, the playwright applies whiteface makeup to become George, the protagonist of the play within a play, as well as M’Closky, the villain of the piece. Within this frame, we encounter a diverse tapestry of characters played in highly stylized fashion, from black women playing slaves (Maechi Aharanwa, Pascale Armand, and Danielle Davenport) with the speech patterns of twenty-first century city-dwellers to white men in black- and redface playing minstrel show versions of Indians and slaves (Haynes Thigpen and Ian Lassiter, respectively), to a white woman playing a burlesque caricature of a wealthy airhead (Mary Wiseman). Pointedly, the only character played straight is Zoe (Amber Gray), the tragic, titular Octoroon. This is all further complicated by the periodic appearance of a silent Br’er Rabbit, the trickster character of African American folk stories, here played (uncredited) by Jenkins, the actual playwright of the piece. Director Sarah Benson deftly weaves together these highly theatrical creations with the contemporary scenes that seduce the audience into letting their guard down. The plot, adopted from the aforementioned melodrama, hardly matters, except to say that much of it is played broadly for laughs, an uncomfortable situation for many in the audience given the pointed application of minstrelsy on stage. Benson further implicates the audience during a slave auction staged to include them as potential bidders. The moment where the laughs abruptly stop is as fearless and confrontational a moment as I have ever experienced in the theater, and it is immediately followed by a coup de théâter that is simultaneously delightful and brilliant in its ability to allow the play to continue without letting anyone off the hook. These two back-to-back beats are the perfect intersection of writing, direction, and design (with extra credit due to Mimi Lien for sets and Jeff Sugg for projections) that can only be achieved in live theater, and they are sure to leave audiences thinking well beyond the final curtain call.